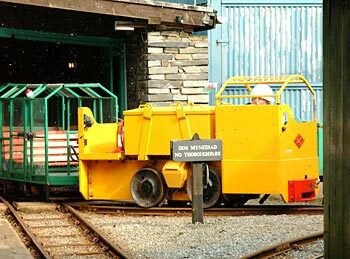 Additional information about the Battery Operated Locomotive Graphic: The Llechwedd Slates Mines were started by John Whitehead Greaves 1846, in 1972 they were opened to the public using these battery-operated electric locomotives to haul specially designed passenger cars (trams). Siteseen Ltd. are the sole copyright holders of this Battery Operated Locomotive picture, unless otherwise stated. We only authorise non-commercial picture use and particularly encourage their use for educational purposes. This Battery Operated Locomotive picture is not in the Public Domain. 3) Use of this Battery Operated Locomotive picture, or any of our pictures on websites re-distributing copyright free material is strictly prohibited.